Christmas and Easter are the best-known holidays in Christianity. But the calendar is filled with many other holy days, liturgical days, seasons and feasts that commemorate Christianity’s deep history. The 100 Most Important Days in the Christian Calendar lets you experience your faith more fully throughout the year by revealing the stories behind the most sacred days and why we celebrate them. You’ll discover the rich histories of the four Sundays of Advent, the 40 days of Lent and Pentecost, and the many Feasts of the Saints, as well as learn the significance of Epiphany, Palm Sunday, Maundy Thursday and Good Friday, among many other holidays. You’ll also read about the saints, martyrs and heroes who are part of Christianity’s most inspiring stories and discover the religious significance of Mardi Gras, Valentine’s Day, St. Patrick’s Day, Halloween and other feasts celebrated throughout our culture. 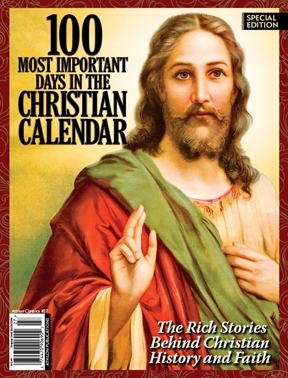 Most importantly, 100 Most Important Days in the Christian Calendar will help you rejoice in the fullness of life as a Christian and is sure to become a treasured part of your daily devotion.